Treadmills might be one of the most boring machines I use at Planet Fitness. Clearly, I’m no workout guru, heck, this is Planet Fitness. But I know the benefits of a good cardio workout. I also know the effects of boredom and non-working TVs at Planet Fitness. hence, our article on treadmill mounts for an Apple iPad or other tablet. When working out at my local Planet Fitness, they have a bank of televisions. Half don’t work, the other half are tuned into CNN or Fox News. That just adds to the monotony of working out. I need something entertaining. Something different. Like Ozzy Man Reviews on Youtube. You aren’t going to get that on the Planet Fitness TV bank. A tablet is needed for this. 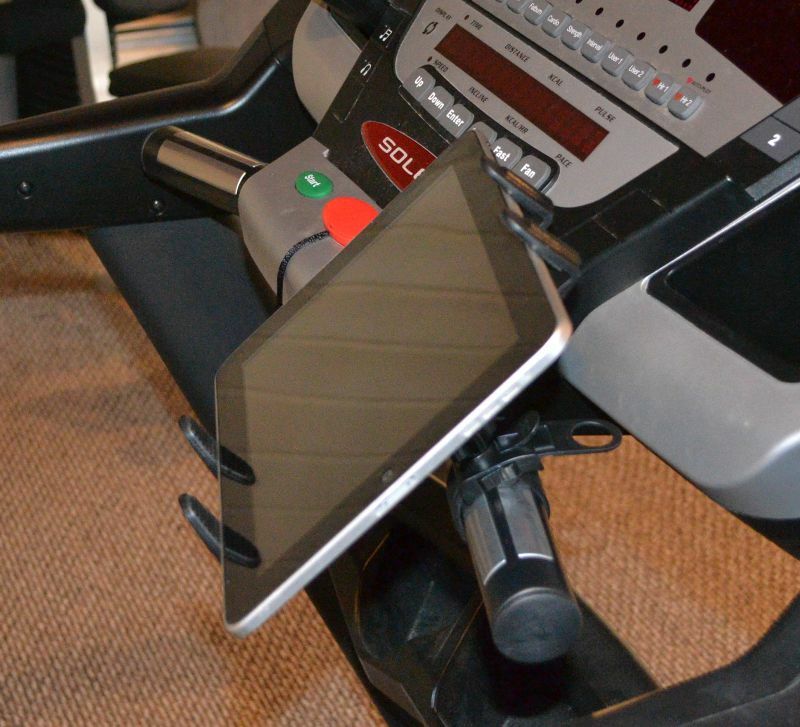 This article is going to cover treadmill mounts for an Apple iPad or other tablet. You can’t place it on the control panel of the treadmill. It’s going to cover the electronic controls or slide off. You need to attach it to one of the handlebars. The advice we will give here is universally applicable to most treadmills, not just the models at Planet Fitness. You need to make sure that the treadmill has a handlebar similar to what you see in the photo that accompanies this article. In fact, that’s my Apple iPad mounted to a treadmill. Most handlebars on a treadmill are in the neighborhood of 1 – 2 inches diameter. You would think that any handlebar mount made for a bike or motorcycle would fit fine. That’s generally not the case. The majority of handlebar mounts for bicycles and motorcycles are in the 1 – 1.25 inch diameter range. On a treadmill, the diameter can exceed 1.25 inches, often approaching larger diameters. So get a mount that fits a round bar and is adjustable up to at least two inches. Also get one that is easy to install and remove. I find that strap mounts work the best because they fit handlebars from .5 to over 2 inches. They fit the criteria of being easy to install and remove. You need these to be portable. Planet Fitness staff looks unfavorably on those that grunt or leave their mounts permanently attached to their equipment. That brings me back to the mount in the photo. That’s the Handlebar Tablet Strap Mount for Apple iPad, iPad Air, Samsung Galaxy. I use this to hold my Apple iPad. It holds tablets that are the size of an Apple iPad Mini all the way up to the Apple iPad Pro. It’s also going to fit most Android tablets except for the smallest 7 inch screen models. The included strap fits handlebars up to about two inches. Easy to install and remove. The included expandable cradle opens up to 8.5 inches and fits tablets with or without a case. The tablet can swivel and pivot into any orientation. This is made by a company out of California called Arkon and comes with a two-year warranty. You might find that clamp bases make for good treadmill mounts for an Apple iPad or other tablet. That’s the Arkon Heavy Duty Clamp Mount for Apple iPad, iPad Air, Samsung Galaxy. It uses the same expandable cradle as the prior mount so it will fit most tablets with or without a case or skin. The clamp base opens up to 2.25 inches and is made of metal. A short 4″ base attached to the clamp. A two-year warranty comes with this mount. In some cases, a handlebar near the front of the treadmill isn’t available. You might need to use the side rails. The Arkon Heavy Duty Clamp Mount with 12 Inch Neck for Apple iPad, iPad Air, Samsung Galaxy. This has a clamp that opens to 2.25 inches attached to a 12 inch flexible neck that be bent towards the front of the treadmill to get a better view of the tablet. This includes the same cradle as the prior two mounts which opens wide enough to fit most tablets with or without a case or skin. This is also easy to install and remove. There are other treadmill mounts for an Apple iPad or other tablet that aren’t mentioned here but these three provide a good representation of the options out there. The things to keep in mind while choosing a mount are to ensure it’s easy to install and remove, has a cradle that will fit your device and has an adjustable case since you never know what the diameter of the mounting location might be at a health club like Planet Fitness.